That's precisely the point. If they aren't forced to budget better and be more accountable and transparent, they'll continue to make excuses about why they can't make more of their stations accessible. It's a similar thing with accessibility to transportation in the outer boroughs and something else that I focus on in my advocacy group, because we haven't had subway expansion in the outer boroughs in decades. Why? "Too expensive", so in other words, it will always be "too expensive" unless they are forced to make changes to bring about changes that are "in their budget". I'm saying that the age of the station isn't an excuse, especially when the oldest station in the United States, Park Street in Boston, is fully accessible. As for your two examples, frankly they should rip up the street in both locations just to fix the current circulation issues and at the same time add elevators. It is impossible to get around the city by subway. PEOPLE HAVE NO CHOICE. Most hard-working New Yorkers can't afford to take an UBER or LYFT, or don't have the time to detour to the nearest ADA-Accessible stop. Stop apologizing for the MTA. For narrow platforms, can't they put in those narrow elevators they have in Europe? As for blaming the MTA , what if she lives in a house with stairs? Or a walk-up building with no Elevator? This Outrage and blame is getting out of control. Sorry, but why is it that in the discussion of an innocent private citizen dying vs. a major corporation sitting on their asses, there are people siding with the major corporation? I'm sure the MTA won't lose any sleep tonight over some incredibly mild and polite comments being left on this thread. The MTA, just like any other company, is going to continue to do things the way they are until there is financial or legal incentive for them to do otherwise, and as such criticizing them for not making stations accessible is entirely reasonable. I get that we're fans of the subway here, but being fans of something means wanting it to improve and be better. What about it? You're comparing a PRIVATE household to a PUBLIC agency that is responsible for providing ACCESSIBLE transportation to ALL New Yorkers. Can't compare the two. You need to read up on the ADA accessibility LAWS. If I move into a building with no elevator I have a choice to rent elsewhere. People that need PUBLIC transportation that is supposed to be accessible to the masses don't have a choice. The difference here is PUBLIC versus PRIVATE. It's sheer ignorance. The is NOT a corporation. It is NOT private. It is a PUBLIC agency, which means it is beholden to ALL taxpayers, both able bodied AND disabled people. People here don't understand the laws and the difference between a public agency and a private corporation. That's the problem. The laws dictate what a public agency should be doing versus a private entity. A perfect example: Whenever there are events for the PUBLIC the venue BY LAW must be ADA accessible. Why? So as not to discriminate against people who are disabled. Focusing on stations like 14th St is a distraction. The VAST majority of stations in this system have straight, 15-20 foot wide platforms either 20 feet above or below the street..and yet they still have not been done. 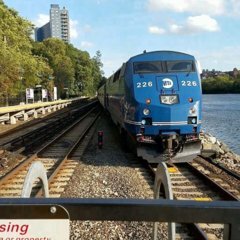 For years, the MTA has shelled out massive sums of money for Access-A-Ride and similar programs, which are palliative, inherently unequal solutions that in the long run accrue more cost than elevator installation -- to say nothing of the fact that they only serve one elevator-needing constituency, the disabled, while leaving mothers, people with large packages, the elderly and the lazy out to dry. That's just bad policy, for beyond the fiscal irresponsibility of it all, it's hurting those who are already vulnerable. In an era where we spend capital dollars on glitzy granite for new subways and shiny tiles for the old, I think some...objection is warranted. So look. You can cry and criticize folks who give a damn about accessibility over some supposedly unnecessary level of outrage, but when you do, keep in mind that many of us are not ashamed by our anger. This has been the law for public facilities for decades now, and the MTA -- having renovated most stations in the system since its enactment -- has flagrantly disobeyed it. Outraged? Abso-f**king-lutely. Shore Road in Bay Ridge... My God... With all of the $$$ in that area, it was amazing how horrendous the sidewalks are from 99th all the way up to Bay Ridge Parkway. Most sidewalks are a mess. So look. You can cry and criticize folks who give a damn about accessibility over some supposedly unnecessary level of outrage, but when you do, keep in mind that many of us are not ashamed by our anger. This has been the law for public facilities for decades now, and the MTA -- having renovated most stations in the system since its enactment -- ﻿has flagrantly disobeyed it. Outraged? Abso-f**king-lutely. That's exactly it... IT'S THE LAW!! Even if you disagree with the policy, it's illegal what the is doing, which is why they've been taken to court and FORCED to comply with the ADA laws on the books. They don't comply because they want to. They do it because they are required to by law. Big difference... I hope the people siding with the get it now. There are houses on Shore Road in the millions, yet the property owners leave their sidewalks in horrid conditions. The park on the other side of Shore Road is another matter entirely. Actually they're supposed to maintain their sidewalks by law. The City has been lackadaisical in enforcing what's on the books. That's the problem. The sidewalks where I live are definitely nice and smooth and my landlord makes sure that they are because he doesn't want to be fined by the City or face lawsuits from someone should they trip and fall. I vividly remember when I went to Fort Hamilton HS one morning, someone must have left a hose on or something overnight because the whole sidewalk and driveway in front of their house was covered in a sheet of ice and the hose was still pouring water when I walked by at 7 AM. Jumping off the GWB is (well, in the most immediate sense) a choice you make. Having been shot in the leg? Having to take care of kids to make money? Having to move large items on a budget? While I do (kind of) agree with the point made, I'd also like to point out that because of the way things were built decades ago dosen't mean you can't improve it. That's completely different. You of all people should know the difference. As someone who used to work on the insurance end of things and has numerous lawyers as clients, I deal with reviewing contracts and all sorts of things related to liability. The as a PUBLIC agency is responsible for creating AND maintaining a SAFE environment, and YES passengers should expect SAFE conditions when they are on property. That's not up for debate. That's what the law says, so that means that if you slip and fall down the stairs because the didn't maintain their stairs, yes, you could sue the for not providing a safe environment. As for your other scenario, less likely, but should someone decide to bring about a lawsuit on the Port Authority, the question would be, what measures did the Port Authority take to mitigate risk? The law is pretty cut and dry. ANY PUBLIC agency has certain duties that they are responsible for BY LAW. It's that simple. You can disagree if you want, but that's what the law says, and that's why many people that sue win, even if they should've been more careful. The burden usually falls on the public entity to provide a safe environment, and then the question is what is considered "reasonably safe"? The point isn't that things can't be improved, but to just cast blame onto another entity when the blame should be pointed at the person IN THE MIRROR. I've seen plenty of people help women with strollers and I've even helped quite a few. She took it upon herself and fell, we still don't even know if it was an "accident". I'm tired of the Pied Piper mobs. As for your other scenario, less likely, but should someone decide to bring about a lawsuit on the Port Authority, the question would be, what measures did the Port Authority take to mitigate risk? The law is pretty cut and dry. ANY PUBLIC agency has certain duties that they are responsible for BY LAW. It's that simple. You can disagree if you want, but that's what the law says, and that's why many people that sue win, even if they﻿ should've been more careful. The burden usually falls on the public entity to provide a safe environment, and then the question is what is considered "reasonably safe"? Yes, it's the law, and yes the environment should be safe, I should not have to worry about the signs in the subway falling on me , etc. But there is personal responsibility which they are, and have been trying to outlaw. The MTA provided a safe environment she lady fell on her own. In this case it appears to be that her death was due to a health issue. If it wasn't though, then the would definitely be under scrutiny. It would be on them to demonstrate that the stairs were indeed safe. I've seen numerous slippery spots in the last few days where one could slip and fall. Quite frankly that's all that would be needed for a lawsuit. A good lawyer would argue that the should've done more to ensure that the steps were indeed safe. Given how slippery many of their floors are, it wouldn't be that hard to win. I have almost slipped and fell with rain boots on, simply because of the slippery floors. Would it be the 's fault? Yes because they should've taken measures to address the problem other than putting up signs. You're dealing with the riding public with THOUSANDS of people using these stations every day. The burden definitely falls of them to be in compliance from a safety perspective. The whole point of accessibility laws is so that anyone can get around without having to rely on another person. What if she was in a hurry? What if no one was interested in helping her? Is she just supposed to idle around indefinitely in the hope that someone will come along and help her? That's a ridiculous, 19th century way of looking at the rights of everyone to move around freely. There's a river with no bridge, no ferry, and thousands of people wanting to cross -- say the only place they can get food is on the other side. Many cross and drown. Is it the victims' fault for doing what was necessary, or was it the city's fault for not building the bridge? Risky decisions have contexts. In this case, the ME's office suggests that the death wasn't totally related to the fall, but the point still stands: there would never have been a risk of fall or a need for assistance if there had been an elevator. Yes of course. This appears to just be a tragic accident. And this is what I'm talking about. Quick to misplace blame. The same thing could have happened at a station WITH a working elevator.